Where we had settled into a nice grove of “overscheduled activities, underscheduled academics”, that is no longer serving BigGuy. It WASN’T serving Girly, but now I’m realizing that was because, at the time, most of the activities were not for her. Now, there is a good balance. She has soccer with two different groups that end up having her busy during evenings Monday, Tuesday and Wednesday and for about an hour on Saturdays; and BigGuy has Scouts an evening each week for Scouts and another for choir–with additional things intermittently on the weekends. Scouts has a weekend outing once/month (so far, involvement is roughly quarterly) and choir has two concerts each year plus some other public functions. It’s good. That being said, following BigGuy’s lead last year and trying to provide him with more intensive education at higher levels “not just in a book” has become rather a challenge. What’s worse, he’s not happy with the progress. Meanwhile, Girly is less than thrilled that I am not giving her time for “learning” but now she actually means it. Specifically reading and science (by way of all things birds). It’s time to consider a schedule. 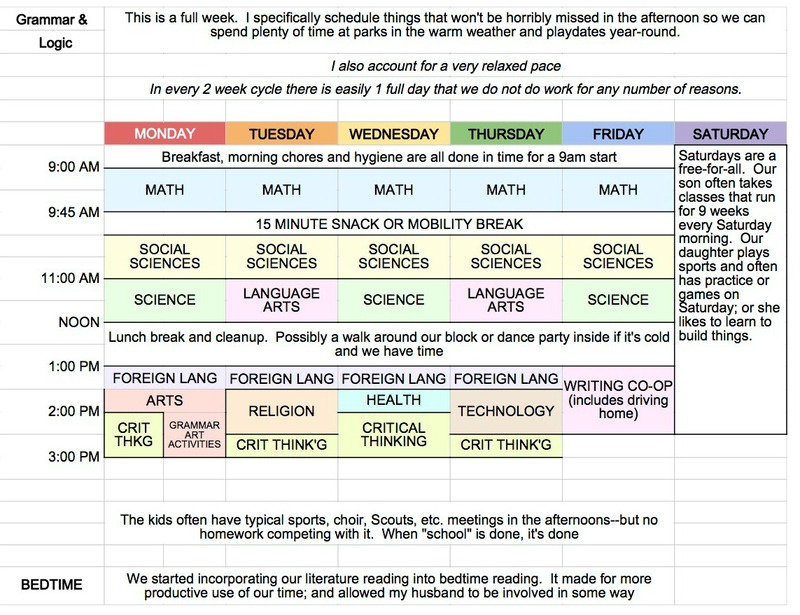 There are people for whom the very nature of “unschooling” is diametrically opposed to the hint of an academic schedule. People view unschooling as loose and free and without confines. That’s exactly what I’m doing here, people. My children have made specific requests and created specific goals based on their individual interests and they are equally free to NOT do any of this stuff. I don’t fight about academics with my kids. But sometimes, we have some serious discussions about it. Sometimes, the parents have serious discussions about it in order to ensure that (especially BigGuy) is not doing more work than is necessary for his stated goals in life. For instance: some of his more recent clarifications around what he wants to do with his life made Husbeau and I consider that–depending on how he feels in another couple of years–he might bypass college and go to technical school for programming or the like. The discussion I had with BigGuy revolved around the fact that it’s not exactly possible for him to churn out the amount of academic work he wants to have accomplished per year if he’s only working from 9am to not-quite-noon and not working those hours pretty efficiently. Reality? He probably COULD bang it out; but he’s 11 and he’s not really well-organized. I suspect that if I spent a good 6 weeks to 3 months hand-holding him, he’d “get it”. But that’s really hard to do and simultaneously accommodate Girly. We talked about the potential for him to be doing academics until 2 or 3pm and he had no issue with this. I, however, have an issue with this. Because we play in the afternoons. It’s playdate time and park time and I’m not sure Girly would be thrilled with the idea of giving that all up. So we’re going to have to really look at this carefully. Husbeau works from home and BigGuy has a contingent of work to do that is computer-based and independent. Still, I’m not loving the idea of him being effectively on a public school schedule. Not now. Not at 11. Here’s how I figure it: I’m going to lay out a schedule for him and we’ll see how it goes. Either it’s going to make him feel great or he’s going to hate it and we stop. Here’s my tentative first shot at a fall 2015 schedule and honestly, I find it overwhelming. I don’t really know how people school-at-home and I’m spending a lot of time eating foods that are highly inflammatory to me in an effort to cope. Tanita, my faithful bathroom scale, is trying to be gentle but honest with me about it. I’ve dipped my foot into implementation of this by way of planning activities. Oh… I think I forgot to tell you that I’m designing my own curriculum because trying to secularize Tapestry of Grace is hard. Plus my kids are both really getting into art and BigGuy really enjoys art history and architecture… so, that. It’s not like I have so much else to do. Math is done online for BigGuy and together (with me) for Girly. Social Sciences will be done together and at the moment–I’m having a hard time isolating this from arts and religion study. I feel like Science has the ability to spill over into some of our lunch time (because some of that hour is spent on lunch chores that I can allow to slide or be re-assigned on a day we need it). Language Arts I THINK can be done together because it’s quite a bit of independent work for BigGuy. We don’t start Writing Co-op until the fall and in the meantime, Science is grabbing that slot. Foreign Language is computer based. And the rest is lagniappe. We push critical thinking all of the time and I’m getting better at this as time goes on. Just reading the Dialectic Discussion teacher pages of Tapestry of Grace has been really helpful. So we will try this and then we have the discussion about what won’t get done and what’s most important to him to get done in what timeframe. Rest assured that these conversations come with a lot of “Why?” from the parent side. “Why do you want to study this?” or “What do you need that for?” or “Why does it need to be done in that timeframe–can it wait?” Effectively, he’s doing things he is committed to doing and we’ve acknowledged his logic for doing it now. To meet him, he doesn’t seem to be horribly motivated. These conversations are kind of eye-opening for me. They are also hard for me. They make me realize just how much I underestimate him sometimes. It’s only hard for a little while–I get over it and move on. But it definitely gives me pause; and the realization that my BigGuy is getting big.